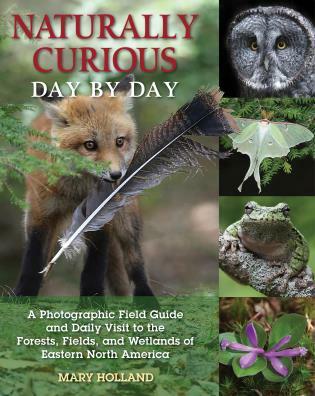 This follow-up to Naturally Curious, a National Outdoor Book Award winner, is a day-by-day account of nature observations throughout the year. Daily entries include entertaining and enlightening observations about specific animal or plant activity happening in eastern North America on that date. Set up as a naturalist's journal, entries describe in detail sightings and events in the natural world and are accompanied by stunning color photographs of birds, animals, insects, plants, and more. Essays throughout describe specific events in nature happening during each month, while sidebars supply natural history facts and information pertinent to the topics of the month or the time of year. Mary Holland is a Vermont naturalist, photographer, columnist, and author. She attended the University of Michigan's School of Natural Resources before working as a naturalist at the Museum of the Hudson Highlands in New York, directing the state-wide Environmental Learning for the Future program for the Vermont Institute of Natural Science, working as a resource naturalist for the Massachusetts Audubon Society, designing and presenting hands-on "Knee-High Nature Programs" for libraries and elementary schools throughout Vermont and New Hampshire, and writing and photographing a nature column called "Naturally Curious" for several newspapers and magazines. Her articles and photographs have appeared in the Valley News, Northern Woodlands, "The Outside Story", Upper Valley Life, Here in Hanover, Woodstock magazine, the Harvard Press, the Vermont Guardian, and the Rutland Herald. She is the author of National Outdoor Book Award winner Naturally Curious.